Over the past 9 months, Board and staff of United for a Fair Economy (UFE) have reflected together on what we need in a leader as we begin our 20th year and the second year of our new 5-year Strategic Plan. We compiled a list of qualities: visionary, motivational, inspirational, collaborative, risk taker – someone who embodies our work with grassroots social justice organizers around the country. As we considered these qualities, and whether to conduct a national search, we realized that the leader we needed was already here, and serving as one of our interim co-executive directors. We are pleased and excited to announce Jeannette Huezo as our next Executive Director, beginning February 1, 2015. Many of you already know Jeannette as a popular educator for UFE. Her expertise as a popular educator and facilitator are well known throughout the social justice community. For 14 years, Jeannette has coordinated UFE’s Popular Education work and facilitated many workshops, particularly for Latino groups. She is also co-author of several of UFE’s State of the Dream reports on racial economic inequality in the U.S. In addition to her work with UFE, Jeannette currently serves on the Board of Trustees of Access Strategies Fund and the National Executive Board of United Association for Labor Educators (UALE), and is a member of the Expert for Color Network at the Insight Center for Community Economic Development. Originally from El Salvador, Jeannette came to the U.S. in 1989 and has spent her life working for justice and social change. In developing confidence and leadership skills in others, Jeannette has increased the number of activists in the movement for social change, and has empowered women, immigrants and others facing injustice to participate in the decision-making process around issues that affect their lives. We are proud to lift up Jeannette as a dynamic Latina woman who exemplifies the leadership qualities we need and who reflects the constituencies that we work with, as well as the changing demographics of the U.S. While Jeannette is a dynamic leader in her own right, her appointment by the Board is guided by the transforming nature of our economic justice movement. 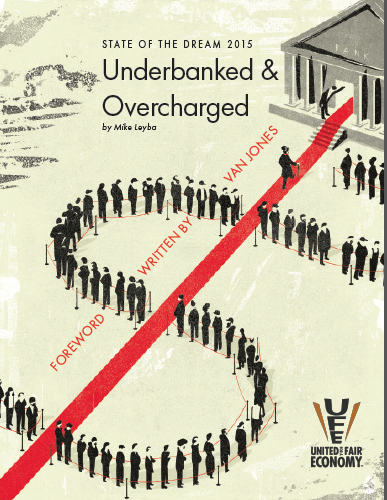 Over the years, UFE has been known for raising awareness about economic inequality. Our future as an organization - as directed by our new strategic plan - is rooted in supporting the growing and dynamic worker-led movement to help build a fair economy. We also want to express our deep appreciation to both Jeannette and Mike Lapham who have so capably guided us through this challenging period as interim co-executive directors. We are excited about the future of UFE and our work together with all of you. United for a Fair Economy is a national, independent, nonpartisan 501(c)(3) organization that challenges the concentration of wealth and power that corrupts democracy, deepens the racial divide and tears communities apart. 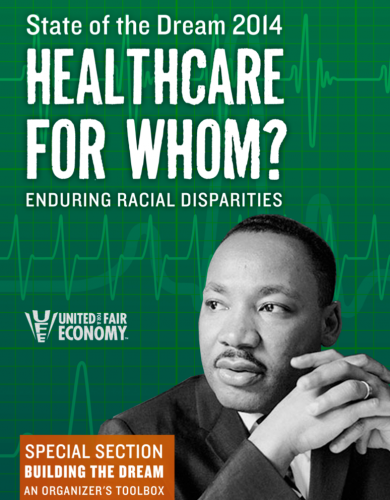 State of the Dream 2014: Healthcare for Whom? is available as a free download at http://www.faireconomy.org/dream. Visit http://www.faireconomy.org/dream/2013 for an embargoed copy of the report. Co-authors and partnering racial justice advocates are available for interview. Misleads About Wealth & Opportunity in the U.S.
Boston, MA—Forbes Magazine calls their list of the 400 richest Americans the "definitive scorecard of wealth in America," but a new report asserts the magazine is misleading. Born on Third Base: What the Forbes 400 Really Says About Wealth & Opportunity in America, released this week by Boston-based non-profit United for a Fair Economy, examines the sources of wealth for members of the Forbes 400 and uncovers the role of inheritance and privilege in economic mobility. The report urges Forbes to stop glamorizing the "self-made man" while minimizing the other factors in wealth accumulation, including tax policies, birthright, gender, and race. The report finds that 40 percent of the Forbes 400 list inherited a sizable asset from a family member or spouse, and over 20 percent inherited sufficient wealth to make the list. In addition, 17 percent of the Forbes 400 have family members on the list. "Forbes spins a misleading tale of what it takes to become wealthy in the U.S. by understating the overwhelming impact of birthright and privilege," said Shannon Moriarty, co-author of the report. "Economic success should be a function of achievement, not just a guarantee for people lucky enough to be born into wealthy families. The Forbes 400 shows that birthright and family privilege are still very much at play in the American Dream." The report explains that the net worth of the Forbes 400 grew fifteen-fold between the launch of the list in 1982 and 2011, while wealth stagnated for the average U.S. household. In 1982, the wealth threshold for the Forbes 400 was $75 million; today, every person on the list is a billionaire. Women accounted for just 10 percent of the list in 2011, and nearly 90 percent of those women inherited their fortunes. The whiteness of the Forbes 400 list also makes clear the racial wealth divide. In the past two years, just one African American made the list. "Instead of asserting that ‘the American dream is very much alive,’ Forbes should acknowledge that the opportunity to become wealthy has never been equally shared," said Moriarty. "The billionaire members of the Forbes 400 are exceptions, not the rule." Born On Third Base takes Forbes to task for their misuse of the loaded term "self-made" and the undervaluing of privilege and social capital in financial success. "We disagree with Forbes claim that 70 percent of the list made their fortunes entirely from scratch," said Brian Miller, executive director of United for a Fair Economy and co-author of the book The Self-Made Myth. "The 'self-made' and 'I built this' narratives wrongly present the opportunity to become rich as equally attainable by all people in today's highly stratified society. Forbes’ story also ignores the important contributions of others and the role of government in the success of the wealthiest Americans." "Tax policies have for decades been tilted in favor of the very wealthy," said Tim Sullivan, federal policy coordinator at United for a Fair Economy. "Tax rates on capital gains have been slashed to historic lows, which is of particular benefit to the likes of the Forbes 400." The report explains that the wealthiest 0.1 percent (including those on the list) receive half of all net increases in capital gains. "Drastic cuts to the federal estate tax made under George W. Bush and extended with the 2010 Obama tax deal have made it easier for wealthy families to keep and amass even greater fortunes," said Sullivan. "As was once said of President George W. Bush, many of those on the Forbes 400 were ‘born on third base’ but claim to have ‘hit a triple,’ and the Forbes 400 list perpetuates this falsehood," said Moriarty. 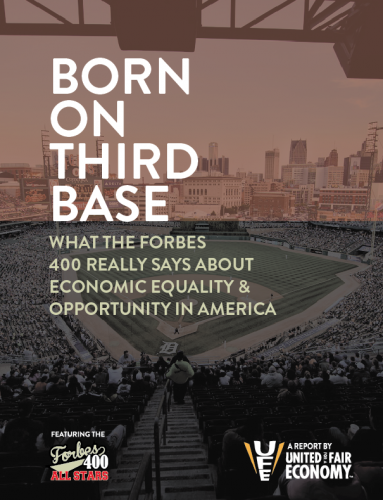 United for a Fair Economy is launching a petition to coincide with the release of the Forbes 400 and the Born on Third Base report, asking Forbes to tell the whole story of wealth and opportunity in the U.S. Download the report and see the petition at http://www.faireconomy.org/BornOnThirdBase2012. Co-authors of Born on Third Base and authors of the book The Self-Made Myth are available for interview. 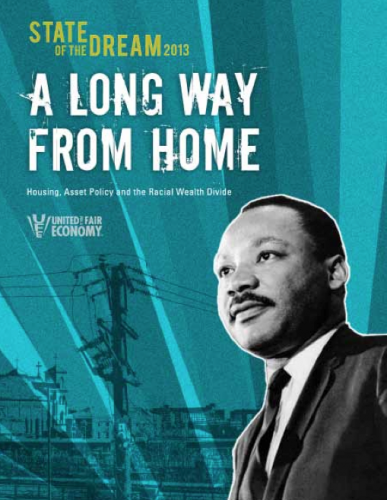 United for a Fair Economy is a national, independent, nonpartisan, 501(c)(3) non-profit organization working to raise public awareness of the destructive effects of concentrated wealth and power and supporting the movement for greater economic equality. Learn more at http://www.faireconomy.org. The Born on Third Base report is available now at http://www.faireconomy.org/bornonthirdbase2012. BOSTON, MA (April 10, 2012) — Tax day is fast approaching, a Senate vote on the Buffet rule is scheduled for next week and the expiration of the Bush-era tax cuts looms at the end of the year. With tax policy at the center of the public debate in this election year, United for a Fair Economy and members of its Responsible Wealth project are supporting tax solutions for the 99%. Wealthy and upper-income taxpayers, including successful entrepreneurs, executives and inheritors, are coming forward to argue that people like themselves should pay higher taxes for the good of the country. They join tax policy experts, organizers, and the majority of the public in support of higher taxes on the rich as the most obvious and sensible first step toward a sustainable federal budget. "The richest taxpayers were handed enormous tax cuts in the Bush years," stated Mike Lapham, the director of Responsible Wealth project. "These tax cuts are driving up our debt and damaging our economy. The rich don't need any more tax breaks, and the country can't afford them." United for a Fair Economy and Responsible Wealth members are supporting tax policies including ending the preferential treatment of investment income by taxing wealth like work, restoring a strong federal estate tax and ending the Bush-era tax cuts. David A. Levine, former Chief Economist at investment-management firm Sanford C. Bernstein & Co., a millionaire and a member of the Responsible Wealth project from New York City, said, "There's no question that we should raise the top marginal rates on people like me with high incomes. Several higher brackets at, say, $1 million, $5 million, and $25 million make sense. We also need to restore the status of dividends as ordinary income. There's no reason to give that form of income as advantage." The Senate is expected to vote on the "Buffett Rule" on April 16. The bill would ensure that people with a million dollars in annual income would have to pay at least 30% in taxes. Responsible Wealth members Deborah Rappaport and Andy Rappaport derive a significant portion of their income from capital gains and would pay a higher tax rate under the proposed Buffett Rule. "Those of us at the top have built our success on a foundation of widespread well being and opportunity, made possible through long-term public investments in education, research, and infrastructure," said Andy Rappaport, a partner at Menlo Park, CA venture capital firm August Capital. "People at our income level won't be dissuaded from work or investment by higher marginal tax rates and less special treatment." Deborah Rappaport, who runs the Rappaport Family Foundation, added, "It's not fair to ask those who make less than we do to shoulder more than their share of our national investment in the form of taxes. This is why, since 2001, we have given our proceeds from the Bush tax cuts to causes supporting economic justice. Those tax cuts were unnecessary when they were passed and now they're nothing less than irresponsible." Tracey Lake, a former Wall Street stockbroker who is currently a real estate developer and investor in Seattle, said, "It makes no sense to tax capital gains at half the rate of earned income. I don't need a lower rate in order to invest. That's just a convenient myth that's been put out there to put a lot more money in the pockets of folks like me who don't need it." As someone who expects to pay the estate tax under current law, she added, "I'm in favor of a lower estate tax exemption. Anyone who dies with more than one or two million dollars made that money with the help of a lot of public investment, and a portion of it should go back toward supporting the public infrastructure that makes it possible." The estate tax exemption is currently $5 million per spouse until the end of 2012, when it is scheduled to return to $1 million. According to Lee Farris, the Federal Tax Policy Coordinator at United for a Fair Economy, "The Occupy movement has struck a chord with its focus on the concentration of wealth among the top 1 percent and the fact that some wealthy people are paying lower effective tax rates than the 99%. A strong estate tax like we had under the Reagan, Bush Sr., and Clinton administrations would generate more than half a trillion dollars over the next decade and curb the growth of dynastic wealth. UFE is organizing thousands of millionaires, wealthy people and ordinary voters to urge Congress and the President to enact changes that will create a tax system that works for the 99%, instead of just the 1%." The individuals quoted above, along with other spokespeople for this initiative, are available upon request by contacting Maz Ali (617-423-2148 x101, mali@faireconomy.org) or Shannon Moriarty (617-423-2148 ext. 108, smoriarty@faireconomy.org). United for a Fair Economy is a national organization working with grassroots organizers and policy experts to close the growing economic divide in the U.S. Responsible Wealth, a project of United for a Fair Economy, is a network of business leaders, entrepreneurs, inheritors and high-wealth and upper-income advocates of progressive tax policies and corporate accountability.